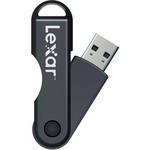 B&H Photo has the Lexar 32GB TwistTurn USB 2.0 Flash Drive Sale Priced at $9.95 with Free Shipping. Tax only in NY. Around $17 at amazon. Ends soon. USB 2.0 but cheap! And no cap to lose.